This unbiased, expert thermostats buying guide will help you find the best type of home thermostat for your heating and cooling system. 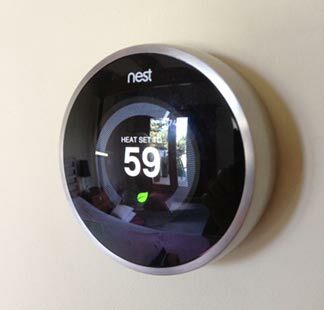 Nest thermostat learns from your daily heating and cooling habits. A home thermostat tells the furnace and/or cooling system when to turn on and off as temperatures in the house or individual rooms fluctuate. This is a very important job, because it affects both comfort and energy bills. Because the human body is highly sensitive to heat gain and heat loss, comfort can be elusive. In the quest to capture comfort, we fit houses with heating and cooling systems, insulation, efficient windows, weatherstripping, ventilation, and other features meant to control unwanted heat loss and heat gain. One of the most essential tools in achieving this goal is the thermostat—a device that controls about 10 percent of all energy utilized in the United States. In regard to comfort, researchers report that the key to comfort is to maintain room temperatures within a 2 degree Fahrenheit swing. Within that “comfort window,” people don’t notice a variation in temperature. To do its job properly, a thermostat should eliminate broad swings in room temperature. During the heating season, room temperature drops to a low point right before the heat goes on and reaches a high just after the heat goes off. Thermostats vary both by their internal operation and by the type of equipment they are designed to control. As discussed in How a Thermostat Works, the two main technologies are electromechanical and electronic. Both electromechanical and electronic thermostats work with most types of gas, oil, electric, and even hydronic heating systems, as well as with air conditioners. Electronic thermostats offer considerably more control than electromechanical models, and their electronic sensing element is more responsive to temperature changes than bi-metal sensors. Simplicity and readability are two important considerations when choosing an electronic thermostat. 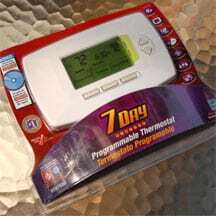 A programmable electronic model allows you to set room temperature so that, in winter, your home’s temperature can dip down to a fairly low temperature—say, 60 degrees—after you’ve gone to bed and then rise to a comfortable 70 degrees when you get up in the morning. Or, if no one is home during the day, you can set it so the house cools down when you leave for work and returns to a comfortable temperature by the time you arrive home. Then, on the weekend, it can change to an entirely different schedule. 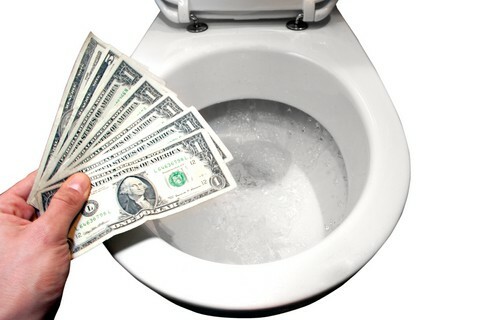 Using a programmable thermostat, you can eliminate considerable wasted energy. As a rule of thumb, every degree you turn down a thermostat will save 3 percent of energy costs over a 24-hour period. In other words, if you turn down the temperature from 70 to 61 degrees for an eight-hour period every night, you can save about 9 percent. Reducing daytime usage similarly can double your savings. When you buy a thermostat, pay attention to the equipment it’s meant to control. Some are intended to control a furnace only, while others will control a furnace and an air conditioner, a heat pump, or equipment that operates in multiple stages that kick-in as the need for heating or cooling increases. If you have a system that provides multiple stages of heating and cooling, such as a dual-speed air conditioner, a furnace with two sets of burners, or a heat pump, you need a thermostat that is designed to handle this complication. Check the packaging for information about the kind of equipment a thermostat can handle. Many thermostats have some type of adjustment that allows the device to suit the system: for example, they may have a small switch on the back or wires that are connected in configurations to match the equipment. This adjustment is necessary because some heating systems are much slower to heat up than others and cycle differently. And some types of heating require system fans whereas others don’t. For example, most heat pumps have an auxiliary electric heating element that kicks on when the room’s temperature drops about 2 degrees lower than the thermostat’s setting (or “set point”). If the room temperature is allowed to drop to 60 degrees at night and is then turned up to 70 degrees in the morning, the auxiliary heat will come on until the room temperature reaches about 68 degrees. In most parts of the country, using this much electric heat is quite expensive. A sophisticated electronic heat-pump thermostat automatically calculates when the heat must come on to bring a room’s temperature up to the set point by the time you’ve programmed. It tells the heat pump to bring the temperature up from 60 to 61 degrees, then from 61 to 62 degrees, and so forth. That way, the electric auxiliary heat is “fooled” into staying off. Zoned heating systems that send warmth or cooling to various rooms of a home depending upon the needs of those rooms require sophisticated programmable electronic thermostats that manage multiple zones. You can really fine-tune your home’s areas for comfort with one of these. Unless you have a multiple-stage heating and/or cooling system that requires a very particular type of thermostat, choosing the best thermostat for your home usually boils down to personal preference, which is generally a dynamic of features and price. State-of-the-art electronic thermostat “learns” your behaviors, eliminating the need to program it. People who have techno-phobic tendencies often prefer the simplicity of a conventional electromechanical model. Those who are interested in more control and potential energy savings opt for an electronic type. Because of its energy-saving advantages, we recommend electronic programmable thermostats. Most electronic thermostats cost more than electromechanical types. For example, a professionally installed Honeywell CT-87 Round electromechanical thermostat may run about $40. A high-end electronic model can cost up to about $200 installed (state-of-the-art models can cost more). You can, however, buy a very serviceable electronic thermostat for as little as $40. Though all electronic thermostats may look alike, they’re not. If one is considerably cheaper than another, there is probably a reason for the price difference. Some low-priced ones may not be able to maintain a narrow “comfort window.” Others may not adequately anticipate at what point the furnace must turn off, thereby wasting residual heat and overshooting the desired room temperature. Equally important is the fact that some types are more difficult to read and program than others. This latter point is very important. 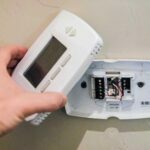 If you can’t easily figure out how to use a programmable thermostat, you may not want to go to the trouble of programming it, negating any advantages and the expense and effort of installing it. Today, most manufacturers are focusing on features. For example, in the pursuit of the ultimate user-friendly electronic thermostat, Carrier (Infinity) and Bryant (Evolution) have each developed thermostats based on input from consumer focus groups. The resulting products are aesthetically pleasing, have large “positive action” push buttons made from soft rubber, and display useful feedback and system alerts such as a “clean filter” indicator. The units also automatically change over from heating to cooling. In the event of a power outage, they hold their programming up to 72 hours—without backup batteries. Both of these have very high list prices—well over $500. A far more affordable “smart thermostat” is the Carrier COR Thermostat. For more see our Carrier COR Thermostat Review. 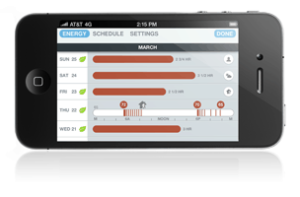 Smartphone tied to state-of-the-art thermostat tracks home energy usage. These are the types of features to look for if you want a state-of-the-art thermostat that will offer you comfortable, efficient control for years to come. 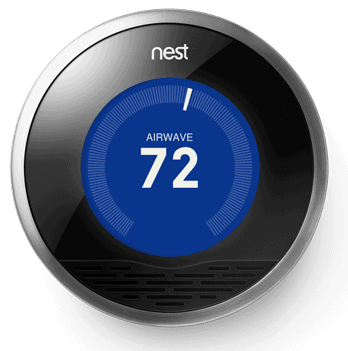 The original super-smart thermostat is the Nest Learning Thermostat. It was first developed by Silicon Valley techies in 2011 but is now in its third generation. This sleek, simple device utilizes sensors, algorithms, cloud computing, and machine learning to learn the behaviors and preferences of a household, then controls the home’s temperature accordingly. It gathers data as you use it, eventually programming itself to meet your needs. And, because it hooks up to WiFi, it allows you to manage your home heating and cooling from a laptop, smartphone, or tablet. Shop for thermostats on Amazon now.